A few years ago we built a lovely new building to contain our well pump. When we moved in, the well pump had been on an open concrete slab and exposed to the elements. That first winter, the pump froze (yes, in Texas!) , requiring an expensive repair job and leaving us without access to water for several days. We knew that couldn’t go on, so we expanded the slab and built a nice size shed to keep it all safe for the next winter. The shed is attached to the side of our 2000 gallon concrete well-tank, which we discovered provides a natural heat and cool sink. The shed will naturally stay about twenty degrees cooler in summer and warmer in the winter than the outdoor temperature. 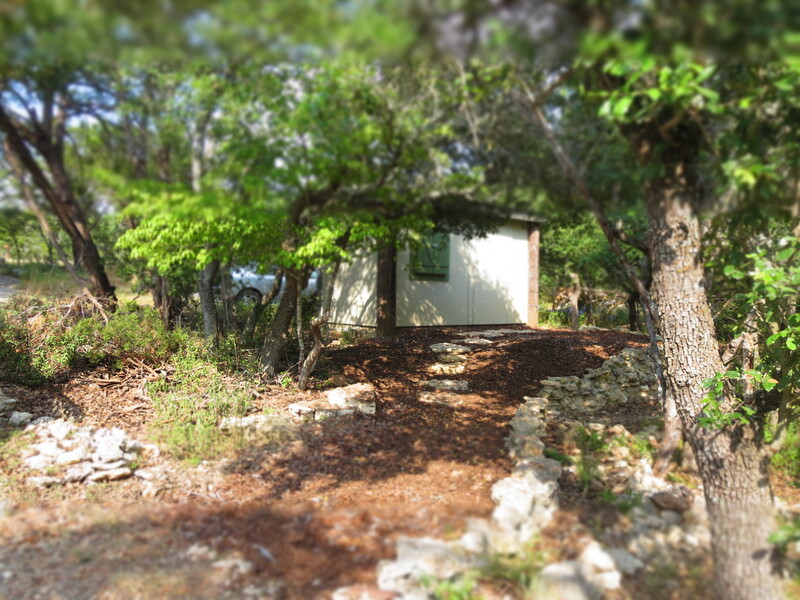 For this reason, the shed also serves as a root cellar and storage for temperature sensitive supplies for the ranch, although we also supplement the natural temperature regulation with a small window air conditioning/heating unit. In the last year, we have built a retaining wall and installed a raised walkway up to the door to the shed. In the rains of this spring, the walkway was overwhelmed by weeds, and so we have decided it was finally time to finish the walk and install proper weed block to keep the area under control. The layer of paper goes down on the path to block out the weeds. 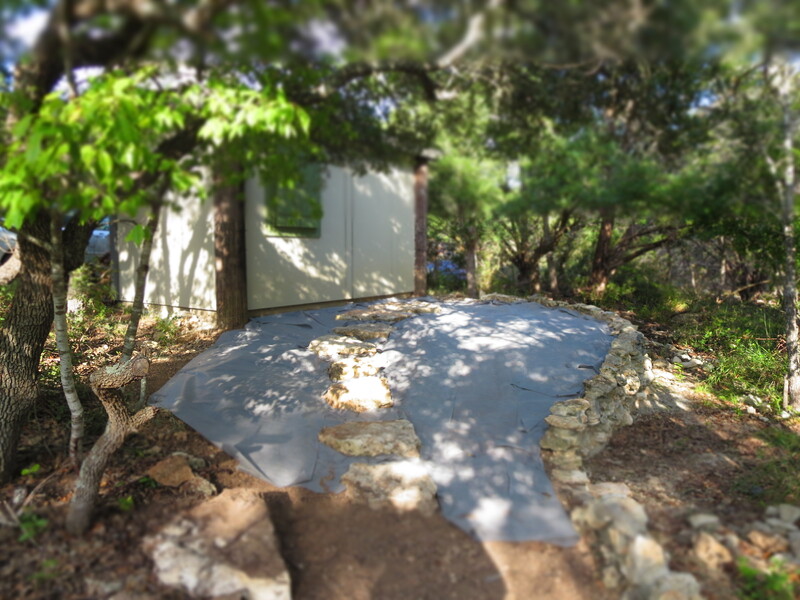 We then flattened the surrounding area, and installed a layer of painter’s paper over the area most deeply impacted by weeds. We hope that the painter’s tape will serve as additional weed block by denying light to the weed roots we were unable to eliminate from this spring’s growth. installations like this. 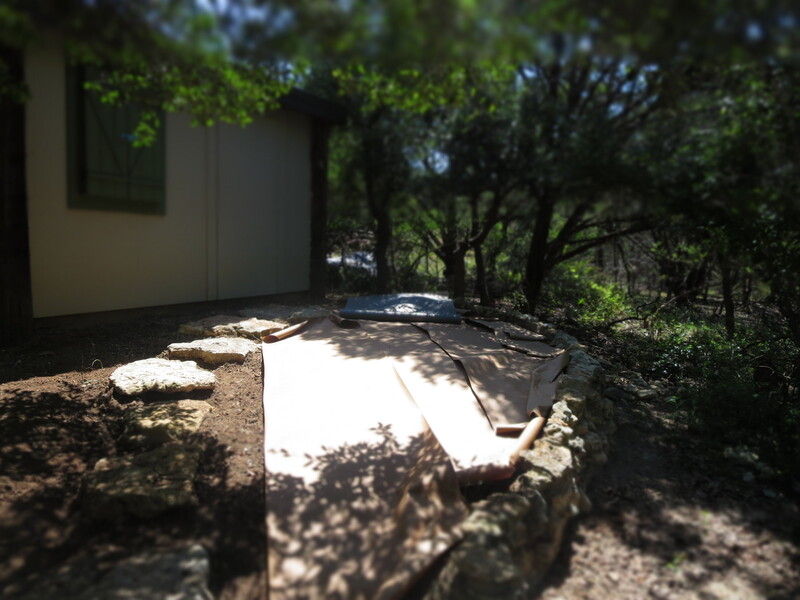 In order to install the cloth around the curve of the bed and between the stepping stones, I needed to fold and manipulate the material, and this fabric was very stiff and hard to work with. I think I would only use it in situations where I was going to be laying it out in very straight and geometric patterns in the future. Finally, we carted in wood mulch, made from wood collected around the ranch. We were actually running low on mulch and have been collecting downed branches and trees to shred up another batch, but I was able to just cover the area by also incorporating some of the mulch that has come out of the garden space as we are installing weed cloth in there. Here is the finally finished pump shed path. I am pretty happy with the end result and I look forward to spreading this kind of finished look over the more formal herb and flower gardens all around the front acre of our land. I have to confess that I was long opposed tot he use of weed cloth, but I have been decidedly converted. If you are putting paths into your yard, you most certainly want to consider how you will keep weeds from growing in them. If you do it right when you set it out the first time, you will save yourself a ton of time not having to cut or pull weeds each season, and even more time and money by not having to go back and do it all again, as I will be doing in the coming months on our own front paths!